"The surname Eddy is derived from the Anglo-Saxon word ead - English. Eade, Eadie, Eddy, being the root for words meaning wealth, prosperity and success. Ead, Saxon, meaning blessed or happy. Eddie, in Gaelic means an instructor. Eddy in Welsh means motion and Eddu in Welsh means to go or to move. Eddy, appearing in the simple form, not compound, shows it is one of the most ancient of Anglo-Saxon names. Without doubt the families of Edie, Edye, Eddie, Eadie, Edy, Ady, Adey are descendants from the same ancestors as those bearing the patronymic Eddy." Also - there is a family story that one of the Eddy Brothers had a cup with the Eddy Coat of Arms on it and it was passed down for a number of generations before it was lost. Because of this story and the consistant referance to the same coat of arms it is beleived that we have the proper coat of Arms displayed on the EFA website. 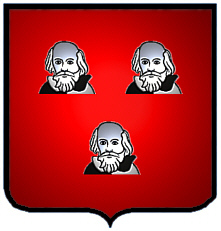 The illustration above is the coat of arms of the Eddy family. As a surname Eddy is derived from the Anglo-Saxon word ead-English. Eade, Eadie, Eddy, being the root for words meaning wealth, prosperity and success ; Ead, Saxon, meaning blessed, happy; Eddie, in the Gaelic, meaning an instructor ; Edd, Welsh, meaning motion; Eddu, to go, to move. Eddy, appearing in the simple form, not compound, shows it is one of the most ancient of Anglo-Saxon names. "The author has made considerable effort to obtain the "Armorial Bearings" of Eddy ; having sent therefor to the Herald's College of London. He has been informed that the arms are not to be found therein ; but, from the best authorities, the shield had upon it three old men's heads couped at the shoulders. One branch had three cross-croslets in the shield, with a cross-croslet and dagger saltierwise for the crest ; the motto being "Crux mild grata quies ." 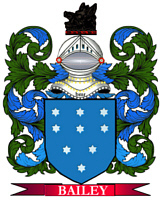 As those only who were in the holy wars were entitled to have the cross in their armorial bearings, it is fair to presume that,is the Eddy family is a very ancient one (Eady being a surname found in "Domesday Book"), some, if not many of the race, like their descendants, manfully combatted against irreligion and infidelity ; and, having devoted the sword to the cross, found in the latter the grateful rest, as indicated by the above admirable motto."